A very heavily cut, hour long version of The Phantom Menace that removes nearly everything that isn’t narratively relevant, including all Gungans except for Jar Jar and quite a bit of both Tatooine and Coruscant. Everything you need to start off a marathon in a lean hour long package. I would like to thank L8wrtr for all of his advice and encouragement in every stage of creating this. Also, thank you to The Aluminum Falcon, who has been a wonderful test critic for multiple versions of this edit. - Huge cuts to Jar Jar, Anakin, Padme, and Palpatine. Trims Tatooine and Coruscant to near minimum. - Ending rearranged for bigger impact. It doesn’t have atmosphere of Star Wars because of just 72 minutes but still enjoyable and fast racing edit. This is a heavily cut version of Phantom Menace, the biggest change being the entire removal of the gungan / droid battle at the end. On the plus side the movie moves incredibly fast and feels much more like a simple adventure. Unfortunately, on the negative side, it feels like huge chunks were crudely taken out of the movie and that not enough attention was paid to the micro-editing; a lot of “yippies!” are left and a lot of the overall silliness remains. The sometimes sketchy audio transitions didn’t help. I still had fun; Phantom Menace is my favorite of the prequel trilogy but lack of micro-editing and the occasional brutal audio transitions made me slightly disappointed. Disclaimer: Nothing in this review is meant as an attack on the editor. The picture looked a bit grainy at some points. Most visible during the pod race sequence. There are some very noticeable harsh cuts here and there. Not a whole lot, but some that can take out the viewer of it a little bit. I don’t feel like I need to list them out, but one example is the transition around the 50 minute mark feels way too fast. The main problem with the editing is the little things that were kept in. A lot of Anakin’s yippees and oops and such are still intact. There was one yippee you tried to cut out but you can still hear it faintly. On a positive note, during the finale, halfway through the Darth Maul fight I completely forgot that you cut out the Gungan battle. There were some nice cuts during that sequence. 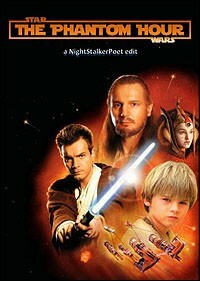 I feel this is a great concept for the prequel trilogy. Three hour long films. Easy to rewatch without a lot of the awfulness. Unfortunately, there is still a lot of the little stuff left in. The pod race scene in particular could have been cut way more than it was. It’s really hard to rate the entertainment level, due to the fact that the original movie is so terrible, but I feel that this edit has the potential to be really great. If the little things were cut down and the transitions were smoothed out, this could easily be an 8. Overall 6/10. This wasn’t bad, but it could have been better.